I’m not one to exaggerate (well, I am a bit), but remember Friday 4th May 2012, for it is the day that a new force arrived on the sausage scene!! This wasn’t like the Chorizos that have come before – worthy as home-made efforts, but workmanlike in their slightly crude, over-salty flavour – no, no....this was the real deal!! As authentic a saucisson sec as I have eaten in the UK....honestly! The first hit when you cut into them was of intense garlic, but this was more pronounced in the aroma than the flavour, which was of deep, lingering pork, complemented by healthy but not over-done seasoning and just a slight sour-ish acidic note....mmmmm. Cheers Max - I'm really pleased with them...definitely a cut above my previous efforts. 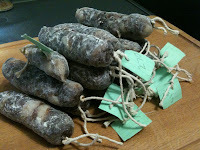 The bactoferm really did it's job - nice mould and a lovely, subtle sour tang, just like a proper French Saucisson Sec! I was thinking salami (your saucisson sec look the business), or maybe some chorizo. I started a lonzino off, then picked up another pork loin half price, so now I have two on the go. Also got another pancetta curing; nom! I've just invested in a proper meat slicer which will hopefully allow me to get appropriately-sized slices. What project have you got lined up next?